Center for Mindful Living, 4708 Wisconsin Ave., NW 2nd Fl. 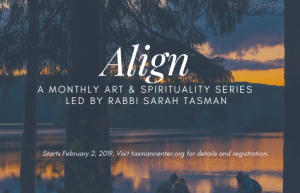 ALIGN: A MONTHLY ART & SPIRITUALITY SERIES led by Rabbi Sarah Tasman A New Moon series incorporating Jewish Spirituality, Seasonal Wellness & Creative Expression - Candle lighting ritual - Learning and discussion - Meditation and/or gentle yoga (for all levels) - Creative writing and/or art - Closing ritual Open to all backgrounds and all genders. Continue Reading..